As I was doodling the other day, the above image appeared on the page. It seems like a good image for Mother’s Day, because it represents (to me) the mother archetype. 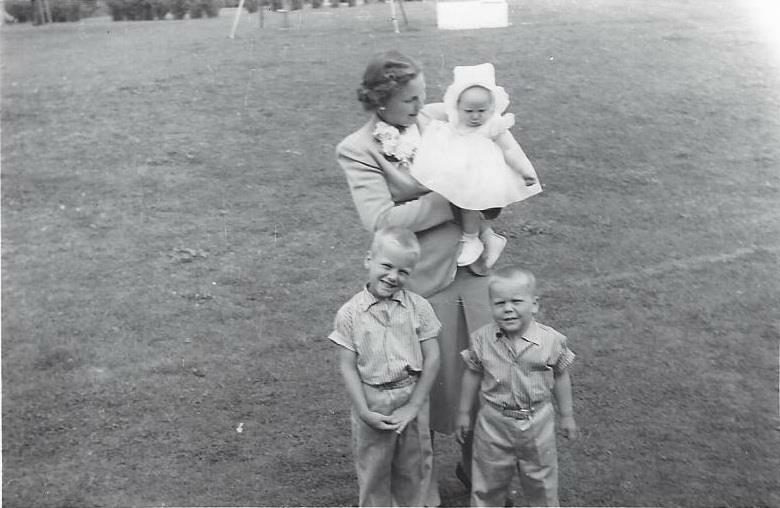 She lives within each of us whether or not we have been a mother personally. She is present in nature and in the lore of Gaia, Demeter and Isis. The divine feminine, she is the giver of life, the protector and nurturer; the one whose language is expressed in devotion and caring. All people, those with children and those without children, carry the mother archetype within. Today as we celebrate mothers, let us celebrate all the people in our lives who embody The Mother, those nurturing people who make others flourish simply by loving them and shining their light on them. And let’s also remember the women who are yearning to become mothers — may you experience peace and hope on this day. Did you know that you are an artist? You are! Mothering is certainly an art form by definition; an outer expression of an inner feeling. 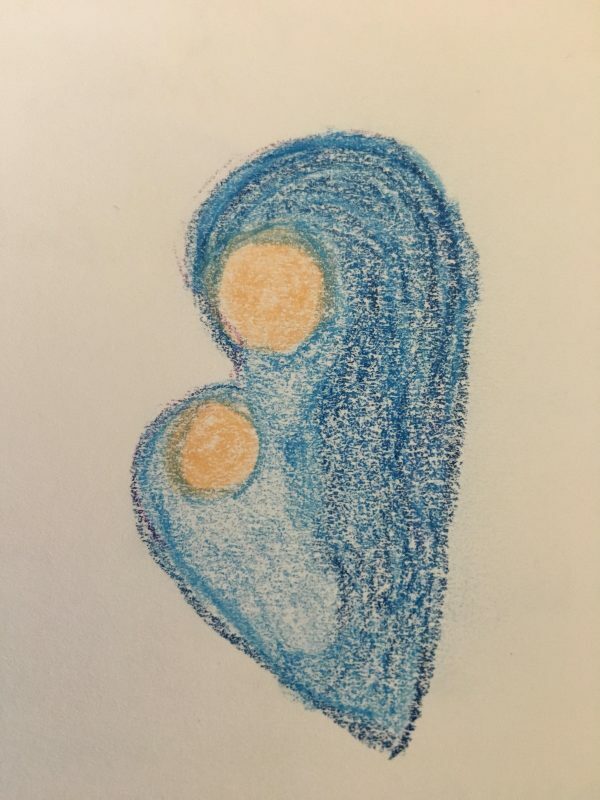 Mothering Arts supports each mother on her unique path of mothering by nurturing connections to herself, to her baby and to her community. As parents there are countless things that we have in common with our lives. We all wake up, prepare and consume meals, we all bathe, play, care for our homes and go to sleep. But within those daily tasks we have a wonderful opportunity to create our family culture, by HOW we do those things. It is how that our children will remember. What do you remember about how you ate meals in your family? How did you get tucked in at night? How did you celebrate holidays, seasons, birthdays? What kinds of feelings arise when you remember? When my mother would put me to sleep as a child, she would puff up the blanket three times over my body before tucking me in. It was such a simple ritual, it felt soft and fresh on my body and my heart was full before drifting off to sleep. Now, my son receives the same special treatment…and he loves it. Some things we can carry on, and some rituals we can create anew. Simple gestures of love leave lasting impressions, feeding the souls of parents and children alike. How do you come to the table? How do you clean the floor? How do you tend to the garden? Can you create magic in the simplicity of life? Can you parent as an artist of life? It’s also necessary to make time for the ways you feed your soul and express yourself. Your child(ren) want to see you shine, they want to know what lights you up, they want to see you be creative. What are the everyday tasks you create with loving intention? Fear not mama if your sewing machine is collecting dust, if your paints are dried up or your guitar is missing a few strings. You are an artist, just by being you. 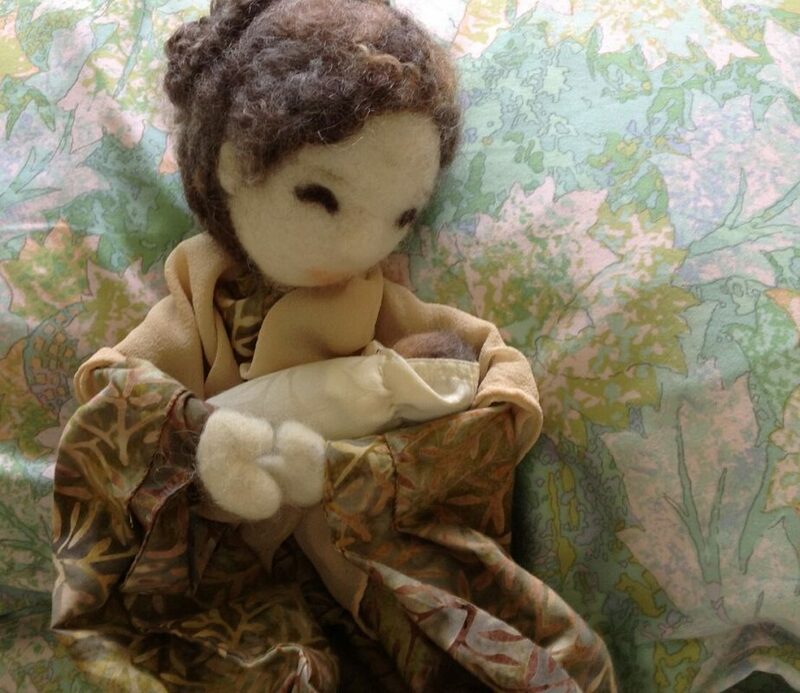 Mothering is an art…perhaps the art that leaves the biggest impression of all. Need a quick and beautiful Mother’s Day gift? 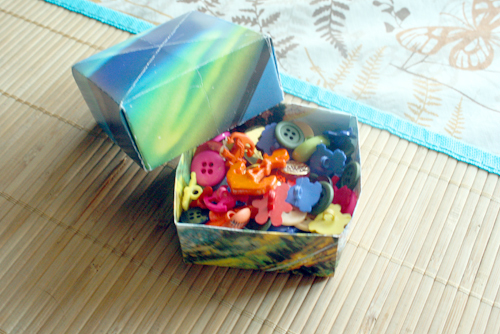 Create a beautiful little origami box to hold some treats (like dark chocolate or something equally as delicious!) This tutorial shows you how to do it using an old wall calendar, but you can also use those lovely wet-on-wet watercolor paintings the children have made! Julia Ward Howe (who wrote “The Battle Hymn of the Republic”) promoted a Mothers’ Peace Day beginning in 1872. Howe called for women to gather once a year in parlors, churches, or social halls, to listen to sermons, present essays, sing hymns or pray if they wished—all in the name of promoting peace. 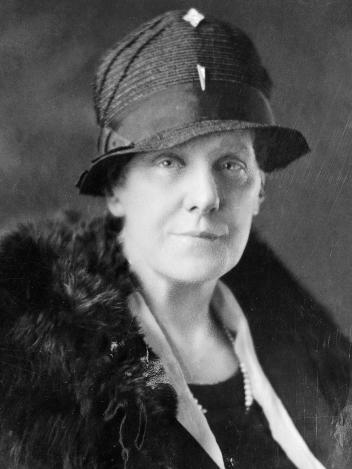 Woodrow Wilson established the second Sunday of May as the official national holiday of Mother’s Day in 1914. 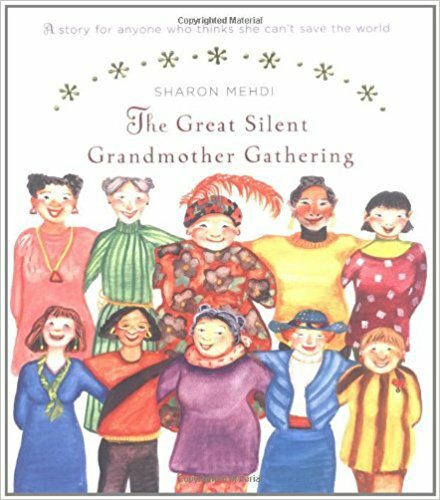 A sweet little parable to help you honor the spirit of Mother’s Day as a day for peace is The Great Silent Grandmother Gathering, by Sharon Mehdi (and illustrated by Mary’s former neighbor, Ellen Anderson!) It’s the story of two grandmothers who stand all day in the park without speaking as their way of protesting for peace in the world, and their action has a transforming effect. 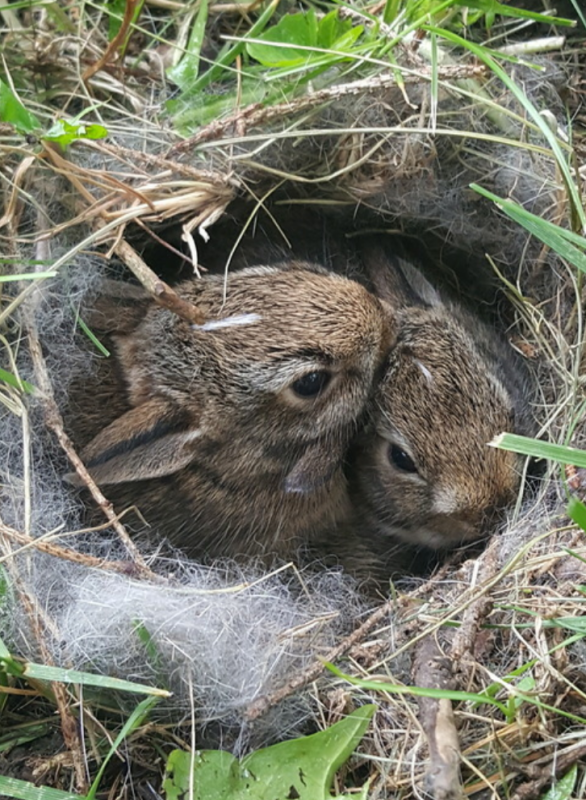 Young mother rabbit gently tucked her last sleepy kit into the soft grassy nest under the roots of the maple tree that stood at the edge of the meadow. Her little cottontails would be safe here under the cool shelter of the branches until she returned. This was her first litter of bunnies; she felt happy and content. Now it was time for her to go out for the day into the meadow sunshine to eat and have a drink of cool, clear water and perhaps stop by the thick cluster of reeds, cattails and bushes, where her friend Henrietta sat on her pale creamy brown and white eggs while Hector, steadfast rooster, guarded her. The eggs were due to hatch any time! She slowly hop-hop-hopped over the little round pillows of moss under the tree and out along the meandering path that lead to the nearby pond. The warm earth felt good under her feet. Her nose wriggled as she breathed in the many sweet and spicy scents, her soft ears twitching this way and that. She looked in wonder all around her at the flowers: the sweet scented violets shyly peeking out, the cheerful golden dandelions standing upright amongst their rosettes of toothy leaves, the grassy green spires of plantain, the purple and white clover, the tiny chickweed stars. She noticed the busy bees flitting here and there over the burbling water in the stream that leapt and swirled over the stones in tiny waterfalls that sparkled in the sunlight. The sky above arched deep blue, with fluffy white clouds floating dreamily by. She nibbled her way leisurely down to the pond, then took a drink of cool, clear water before hop-hop-hopping over to a small still pool among the stands of rushes and cattails. Many tiny fish swam in and out of the tall reeds. 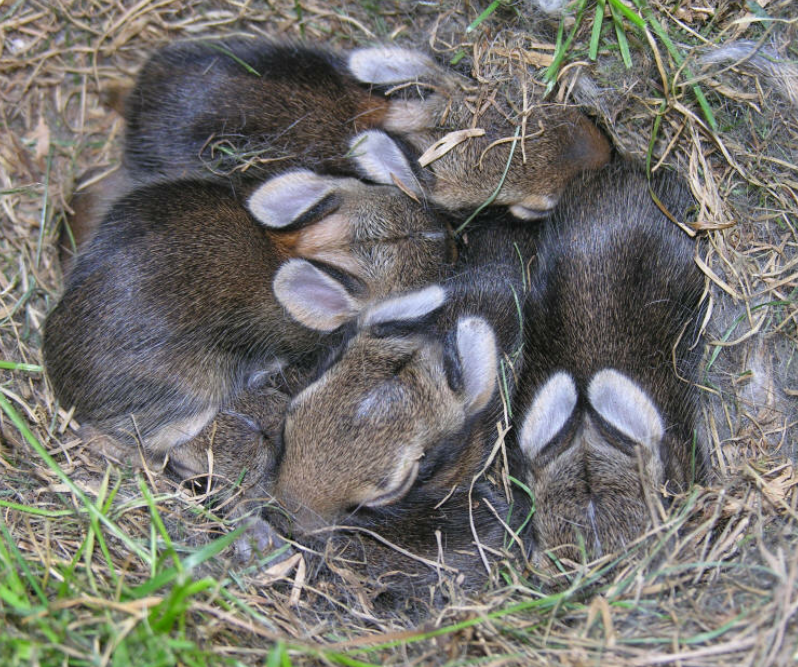 She quietly called out towards the spot where the bantams had their nest; cottontails have the softest, tiniest voices. Within minutes, Hector popped his brightly feathered head out through the cattails to greet her. They chatted briefly then Hector took the opportunity to take a quick dust bath, before pecking some seeds and bugs. He dunked his head into the water, lifted his neck up high, and let the cool water slide down his throat. He was a rooster of few words these days, but he did whisper the exciting news: Henrietta thought the eggs would begin hatching that night. After Hector left, young mother rabbit roamed around the edge of the pond, greeting the songbirds she knew, kind Old Mother Squirrel and another mother rabbit who lived with her relatives on the far side of the meadow, closer to the farm. It was late afternoon when young mother rabbit said goodbye to her friends, took a last drink of water, then nibbled her way hop-hop-hop, back towards the gently sloping path that lead to the maple tree where her kits waited in their soft grassy nest under its roots and sheltering branches. The last warm golden rays of sunshine mixed with the first cool evening breezes when Young Mother Rabbit finally nestled herself down among her babies, kissed them goodnight, and went to sleep. NEW LifeWays Early Childhood Trainings! LifeWays North America is pleased to announce three new training locations, all starting this year! If you’ve been thinking about taking the LifeWays training, there is no better time to do it. We’ve been waiting for you. Won’t you join us? Norman, Oklahoma begins in August! Westport, Connecticut begins in October! Miami, Florida begins in November!